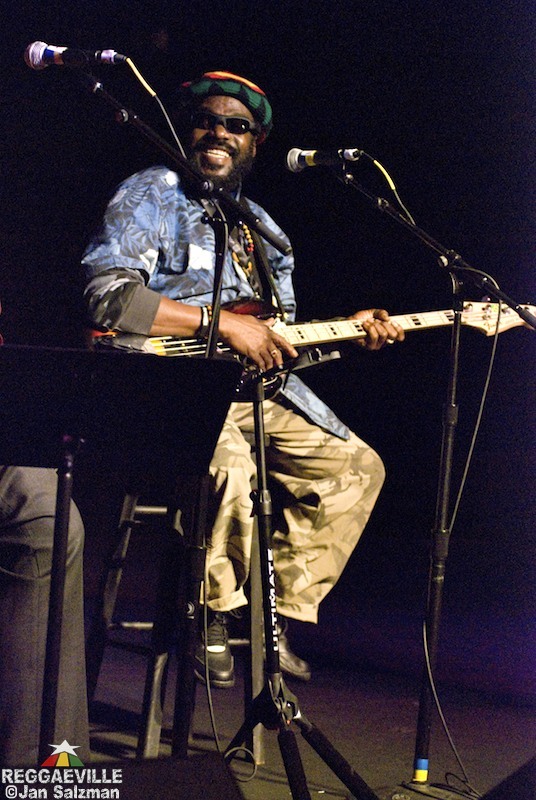 Legendary Wailers bass player, Aston "Family Man" Barrett was honored at the annual Bass Player magazine's Bass Player LIVE! event with a Lifetime Achievement Award. In addition to the award ceremony, Family Man performed with a group of Los Angeles-based reggae musicians in a short set and spoke to a capacity crowd earlier in the afternoon. Each year the Bass Player LIVE! event brings players, manufacturers, and artists together in an intimate environment. The interview and question and answer session took place at SIR studios where there were live demos and clinics and the concert event was held at Key Club both located on the Sunset Strip in Hollywood, California. Reggaeville was in the house at both events, the packed house at SIR studios was wowed at the opening of the 1 hour-plus session where Family Man opened with no words, but with several recognizable basslines and was introduced by Bill Leigh from Bass Player and Elixir Strings as the "architect of reggae". Family Man told the tale of making his first bass from a 2x4, a curtain rod and a piece of plywood. He went on to explain that when he is playing, he imagines himself playing an upright bass to get the distinct feel that he delivers, currently performing on a Fender Jazz bass. Family Man made mention several times of his brother Carlton Barrett, drummer for the Wailers who he began forging the reggae sound with as a youth. He mentioned Robbie Shakespeare who he originally taught to play bass, and also mentioning Owen Reid as one of his students, bassist from Julian Marley's band. Family Man explained the genesis of the Wailers band, when he worked at a studio as a 9-5 house musician and Bob Marley heard about some "different sounds" on the bass upon his return Jamaica after living in Delaware in the U.S. Bob asked who was playing those sounds, and Family Man said "they told him it was a guy they call Family Man and his brother." Family Man then went on to explain the progression from his first band, The Hippy Boys and then to the Upsetters which was actually Lee Perry's band, he then outlined songs by produced Lee Perry that developed as a result of Bob, Peter Tosh and Bunny Wailer, linking with this band. Also present at the session with Family Man, was Jamaican-born bassist Phil Chen who interjected details about the recording process through the years including the seminal Catch A Fire album sessions in England. When the actual deal was finalized with Island Records and Chris Blackwell, a man who as Family Man noted, "loved music deeply, this I know" they came back to England to rehearse for a tour and their first show as at a club called The Speakeasy. "That is a club where all the press people come, The Gleaner, The Star, the magazines, and of course, the critics, so we did two shows a night for two weeks, and when it was over they write up in the paper, that the first song we played, it 'cast a spell upon them and after that it was like magic", Family Man recalled. Bill Leigh then asked from the stage, "Do you remember what that first song was?'' and Family Man began singing, "Don't you hear the word of the Rastaman say…(the intro from "Rastaman Chant") Babylon your throne gone down," and explaining further, "after that everybody keep quiet, and then we went into Stir It Up and Bend Down Low. Up the street at the Key Club the event began with the award presentation by Bass Player magazine editor Brian Fox and Phil Chen. Family Man made a few remarks thanking the community and then performed a short set consisting of Stir It Up, I Shot the Sheriff, Waitin' In Vain, No Woman No Cry and finished with One Love. Here below is what Family Man had to say regarding the honor he received. 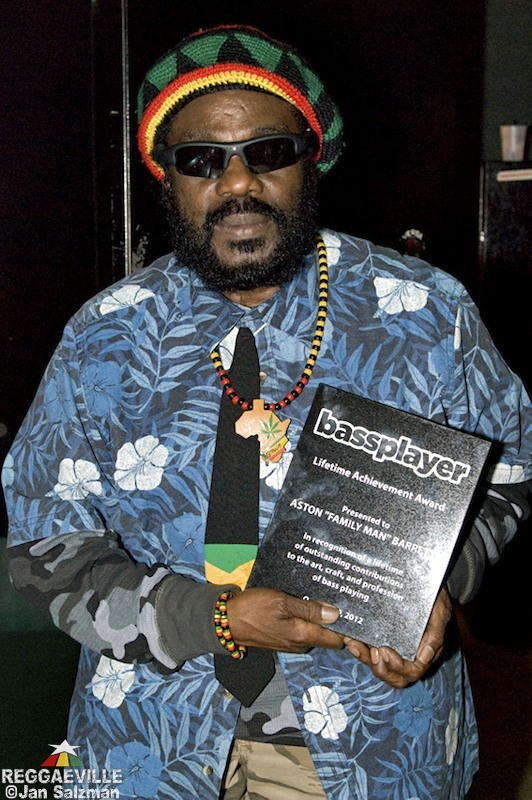 What does it feel like to receive the Bass Player Lifetime Achievement award today? It was a great thrill for me, you know, it was history, Bass Player made for Family Man. I have been on the road from 1969 until 2012 spreading reggae music from Jamaica, but this is the first award that I get in America. What about earlier today at the Bass Player Live event and the opportunity to speak to musicians, what was that like for you? It was a great thrill too, cause they were waiting for me from a very long time, but I know the time was now, but the hour wasn't yet come, until today. What kind of advice can you give to up and coming players of instruments, you have a wide scope of experience, what kind of advice can you give to people? Well they must always remember at all times, that drums is the first instrument in music, what used to carry across the valley and the cities, and the drum has been acknowledged as the heartbeat of the music and the bass is the backbone of the music, so they both goes together, the backbone and the heartbeat, drum and bass, dubwise. What about in terms of your business side and your producer's side, both as a player but also as a business and as a producer of some of the top-selling music of all time, not just in reggae. What type of strength have you drawn from in being so successful in your career? Well it takes me all of those years to realize that, in business, you do not get what you deserve, only what you negotiate, you know and we still give thanks for these up coming institutions what defend the rights of the singers and the players of instruments. And that is so good to know, it is about time, cause the record business really change a lot you know and all of that is handed down to the greed and the technology that is what is changing it up. Tonight you played with musicians that you have never played with before with just a short run-through earlier today, what was it like tonight just to play a short set and to receive that award in a setting such like that, a bit different from what you are used to with your rigorous tour schedule? Yes I realize that too, and I know that too, from I am conducting a rhythm section, they sound different but they sound like what they are supposed to sound, it is a blessing what coming from the Almighty and the angel just flow and free the message from Jah and everyone just sit down real tight.